The rankings at this time of year are more important than ever. With that being said, extra consideration and examination were given to the teams up and down the Top 25 in each of the three small school divisions. Teams at the top of rankings can pretty much rest assured that they’ll get an invite to play in the extended postseason. For them its not a question as to “if” but “where.” A few extra wins with style and substance can determine if they get an opportunity to host a regional and what seed they get in the tournament. Teams in the second half of the rankings need wins to cement their spot to play deep into the spring. A few upsets can easily wreck havoc when there are limited invites to the postseason party. The D-II Southeast Region is one of the best examples of how the final weeks have a monster impact on the season. Catawba was the top club in the official NCAA rankings, but the Indians were upset by Wingate in a pair of games and will surely fall from No. 1. Mount Olive was the third positioned team, but went a miserable 0-2 in the Conference Carolinas tournament. Depending how things shake out in the Peach Belt Conference the Trojans could undeservingly, but not surprisingly, not get to play in the NCAAs. USC Aiken, is ranked 25th overall nationally, but isn’t listed in the official top eight (although Newberry was for some reason, but I digress), yet the Pacers are one of the hottest teams and have an upcoming series with Catawba. Plus, there are already two teams, aforementioned Wingate and North Greenville, who are going to the NCAAs by virtue of winning their conference crown who most certainly wouldn’t be going if they hadn’t won it all. It’s absolutely crazy out there and somehow, someway a determination is going to have to be made on who’s in and who’s out and who’s going to be a host. Nevertheless, here’s a looking at the rankings and rumblings in the small school rankings headed into the final games of the season. Rankings are based on games through Sunday, April 26. The top spot in the D-II rankings continues to be one of the most hotly contested crowns. Top ranked Nova Southeast lost a game to an unimpressive Eckerd team that opened the door for Colorado Mesa to take over the top spot. However the Mavs lost a game to MSU Denver, which, although it wasn’t a bad loss, didn’t help CMU’s cause. Once again, Franklin Pierce, Minnesota State and St. Cloud State did’t quite have the “wow” wins which showed they should take over No. 1. The Ravens only edged SNHU and swept unassuming Assumption, Minnesota State ran their win streak to 18 games but it was agains the ilk of the University of Sioux Falls while SCSU clobbered lowly Minot State. As such, the NSU Sharks are still the top ranked D-II team. With no postseason tournament for NSU, a strong showing this week against Barry could lock up the top seed and hosting duties in the South. There were two big matchups on last week’s schedule that deserve notice. In the PSAC formerly top ranked Seton Hill took on Mercyhurst. Both teams have been impressively stockpiling wins all season, especially the Lakers, who had reached the 30 win plateau with only four losses headed into the four games series. Yet, much like MSU and SCSU in the NSIC, neither team had many statement victories that showed that they were deserving of being mentioned among the nation’s elite. A series win by either team would have been an enormous notch in the belt of the victor. However when all was said and done, the series was a push. Both teams won a pair of games on the other’s home field and walked away with little, if anything, resolved. The two teams will likely get another change to duel it out on the diamond in the conference tournament with Atlantic Regional hosting duties on the line, that is if they can get by a quietly emerging Millersville waiting in the shadows. The other high octane series last week was in Alabama where Alabama-Huntsville visited West Alabama. The teams were second and third respectively in the official NCAA regional rankings and a strong performance in the series, coupled with a GSC tournament title and a stumble by Nova Southeastern, could bring regional hosting duties to the winning team. UAH was the favorite headed into the series. The Chargers had been ranked in the top 10 the entire season and spent a good chunk of time in the top five. UWA was more a dark horse selection than bona fide national title contender. They had a roster with some top talent and looked like they could make some noise, but failed in their only games against a ranked team early this year as they were swept by Columbus State. Nonetheless, what was to be a hotly contested contest was tepid at best as the Tigers mauled the Chargers. West Alabama swept the series by a combined score of 30-6. The wins were punctuated by performances from a pair of Tiger players who have been posting prolific numbers all season long. Utility player Tanner Rainey has been a force at the plate and on the mound. He was recently named a Tino Martinez Award Semifinalist as he is batting .371 with 13 home runs as the team’s everyday first baseman. When he’s not playing first, Rainey has been a lights out closer, dominating the late innings for UWA. In 23 2/3 innings he has only allowed 10 hits and has 45 strikeouts with eight saves. He could easily have more saves, but the Tigers have outscored their opposition 326 to 142 which gives him few opportunities to earn the stat. The Tigers also have a dominating start in Fernando Gonzalez. In addition to earning a series winning game over UAH, he touts a 9-1 record on the season with a 2.05 ERA with four complete games (which also eat into Rainey’s save opportunity total). The Puerto Rican native also has 89 strikeouts in 83 1/3 innings of work with only 70 hits allowed. No teams were dropped from the rankings, although one team was added. On the heels of a four-game sweep of Texas A&M Kingsville, Angelo State rejoined the rankings in a tie for the final spot. With the wins Rams Head Coach Kevin Brooks earned his milestone 400th win. 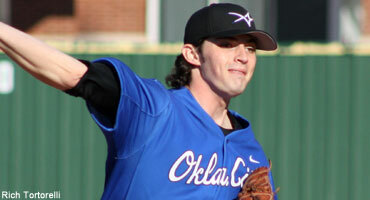 A trio of teams from Oklahoma make up the top three positions in the latest NAIA rankings. Not only are they they cream of the NAIA crop, but each of them has a justifiable argument to be ranked No. 1. Up until the 11th hour before publication, Oklahoma Baptist remained the No. 1 team for the second week in a row. On paper it would have been an easy decision to keep the Bison at No. 1. They have an incredible 45-4 record, have been ranked in the top three all season and lead the nation in hitting with a remarkable .372 average. They’re also in the top three in fielding and have a quality pitching staff as the club has a 3.40 ERA and has a top 10 opposition batting average of .224. However what OBU doesn’t have is top notch, quality wins. The Bison have only played four games against teams that has been ranked this season. They split those decisions with both of their two wins being 5-4 squeakers. As a result, an argument could be made that the reason OBU has such unmatched statistics is because they’ve rolled over weak opposition. With that being said, a new No. 1 has been named. Taking over the top spot in the NAIA is Oklahoma City. The Stars have played their way to the top with an advantageous schedule which leaves little doubt that OCU will be one of the favorites to win the NAIA title next month. The Stars have won games over LSU Shreveport, Bellevue, Tabor, Oklahoma Baptist and Oklahoma Wesleyan. Of their 10 losses to-date, only two have been to NAIA opponents since March 10th and both of those defeats were by a combined three runs. The Stars were a bit of a question marked headed into the season. They were in the initial draft of the Perfect Game preseason rankings, but were bumped in favor of a more experienced team. While OCU had a number of offensive threats returning to the lineup, the pitching staff lost some extremely formidable and important arms. The Stars top three starting pitchers in 2014, Chris Pike, Brad Wieck and Michael Nolan, were all drafted into professional ball at the end of the season with Wieck and Pike being top 10 round selections. Head Coach Denney Crabaugh was able to find a trio of just as formidable aces in Carlos Chavez, Dustin Cook and Matt Young. Two of the three have sub-2.00 ERAs and each has more strikeouts than innings pitched, collectively fanning 229 batters in 198 innings of work. In addition to having pitchers who dominate on the mound, the Stars are stupendous at the plate. Each of OCU’s eight regular starters are batting at least .310, led by impact freshman Joe Lyle who is hitting .387 and ranks in the the top 10 nationally in doubles with 21. OK City also has slugger J.J. Bissell who is in the top 20 nationally in home runs as he averages one nearly every 10 at-bats. The third Oklahoma team worth mentioning is Oklahoma Wesleyan. Like the Bison, the Eagles were projected to be a top five team at the beginning of the season and have been playing as anticipated. OKWU has series wins over Lyon and Bellevue and split a series with York who has 39 wins this season. Wesleyan has also demonstrated that they can go toe to toe with the best of the best, and were edged in one of this season’s most remarkable games when they lost a 22-21 slugfest to Oklahoma City last week. The Eagles are led by two South American players in David Espinoza and Zair Koeiman who hail from Venezuela and Curaçao respectively. The rest of the NAIA rankings remained relatively unchanged since last week. Doane was bumped from the rankings after a difficult week and replaced by William Woods who checks into the Top 25 for the second time this season. The Owls returned to the rankings after winning a series over preseason No. 1 Missouri Baptist who are in a logjam atop the American Midwest Conference standings with three other teams and need a strong performance in the conference tournament to keep their postseason aspirations afloat. Up until this week, UW-Whitewater had spent the entire season in the second position of the Perfect Game D-III Top 25 rankings. No. 1 Cortland State had a perfect 5-0 week, but the Warhawks impressive performance on the diamond the last seven days gave them the extra bump to supplant the Red Dragons as the top team. UWW played the pants off UW-Stevens Point, a team which had been in the top 10 most of the season, outscoring the Pointers 31-6 in a doubleheader. Additionally Whitewater had a pair of wins over a very good UW-Platteville club (although they lost a game to the Pioneers Monday that wasn’t considered for these rankings). The top 20 teams more or less stayed the same with some minor shuffling of clubs; most notably by somewhat underachieving Southern Maine who had a big week to jump from the 17th position to No. 11. Wooster also made a six position move from 21 to 15 after a 6-0 week with nice wins over John Carroll and Heidelberg. The Fighting Scots have a big matchup with week with Baldwin Wallace that could give Wooster another rankings surge if they’re able to pull off the upset. New to the rankings this week are Washington, Tufts and Case Western. The Bears and the Spartans are returning to the rankings after a brief hiatus and its the first appearance by the Jumbos. Tufts earned their NESCAC East Division crown after a doubleheader sweep over Bates. Leaving the Top 25 were Randolph-Macon, Wartburg and a disappointing St. Thomas team that started the season in the top 10.